I am the sort of person who gets very overexcited about new food trends. Whether it is rock’n roll ramen, Taiwanese buns or Peruvian street food I will be standing outside the yet unbuilt restaurant like a needy child, waving my cutlery in the air and shouting ‘Feed me now’ to anyone who will listen. So when I heard that there was a new family-run polenta joint opening in Soho I knew that it and I wouldn’t remain strangers for long. The interior is more stylish cafe than fine dining with an attractive copper bar, wooden tables and menus chalked up on blackboards. For the uninitiated polenta is cornmeal that has been boiled into a porridge with water or milk or a blend of the two. It can then be served wet or else grilled or fried. Polenta provides a comforting base for stronger flavours and at best should be lump free, creamy with the mild corn taste coming through. 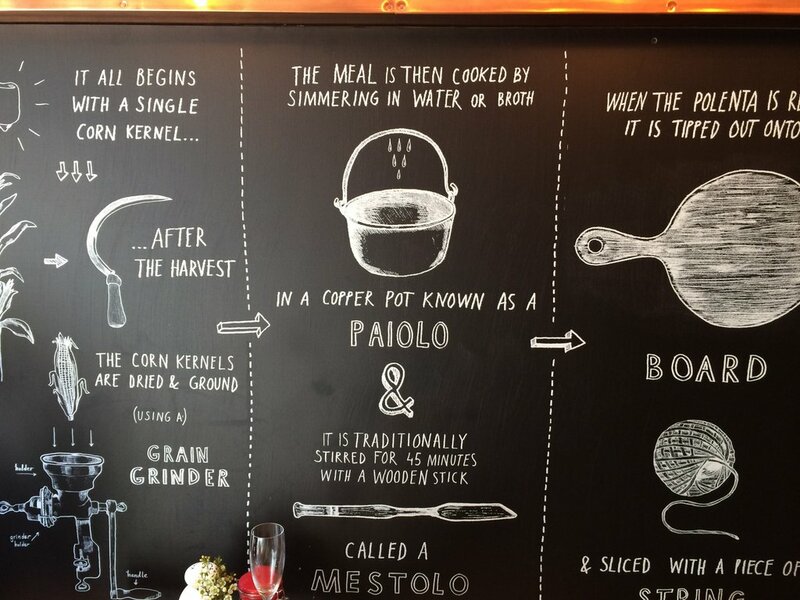 La Polenteria makes a big play on the quality if its cornmeal which is GMO free and also trumpets the gluten free health aspects of the grain, but how will it taste? 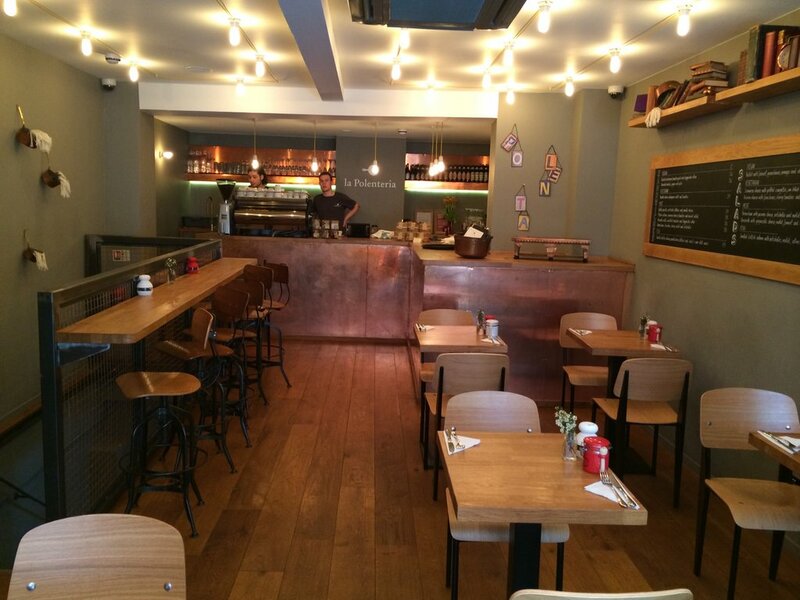 The menu is split into vegan, vegetarian, fish and meat main dishes with the only starter options being little’ polentini ‘ polenta bites at £1-more of a bar snack really. They also offer sandwich and salad options and it was the latter which my lunching companion the chanteuse and I decided to investigate for starters. 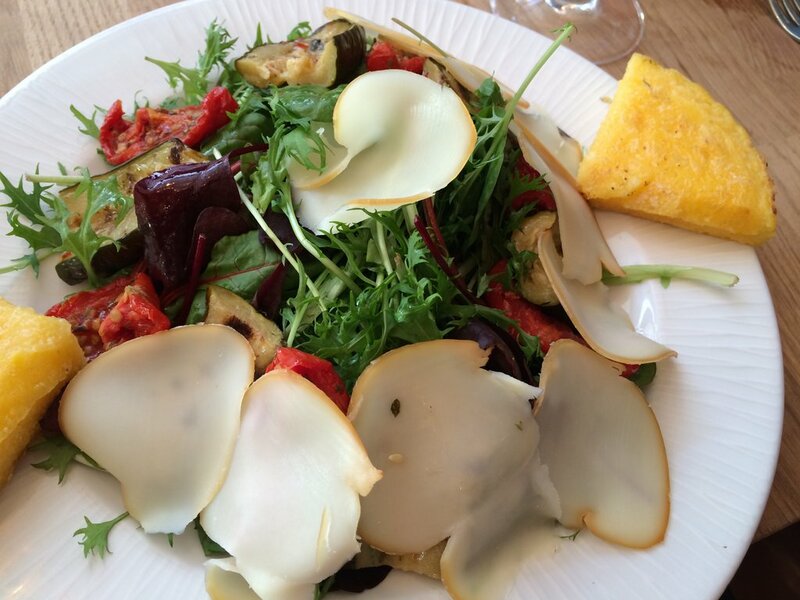 Scamorza cheese with grilled courgette, sun blush tomatoes and mixed salad (£7) combined slivers of the smokey cheese with grilled slices of polenta and the vegetables. The cheese paired deliciously with the cornmeal and the veg gave a good mix of textures and tastes. 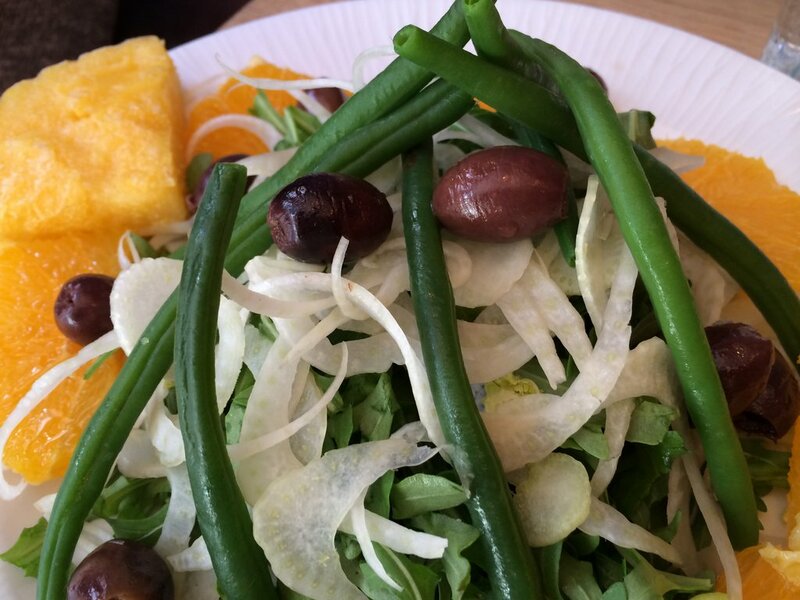 Rocket with fennel , green beans, oranges and olives (£6.5) is a classic dish with the crisp aniseed of the fennel being soothed by the sweetness of the orange. We looked at the list of craft beers and wines and chose a glass each of a sparkling Franciacorta, Brut 25, Fratelli Berlucchi, Lombardia (£7.50). 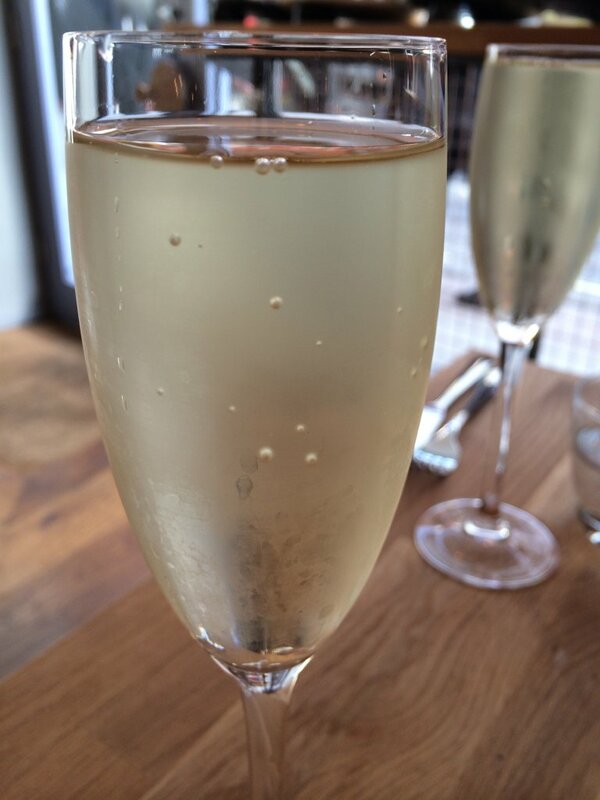 It’s a light, fresh fizz that matched the food. 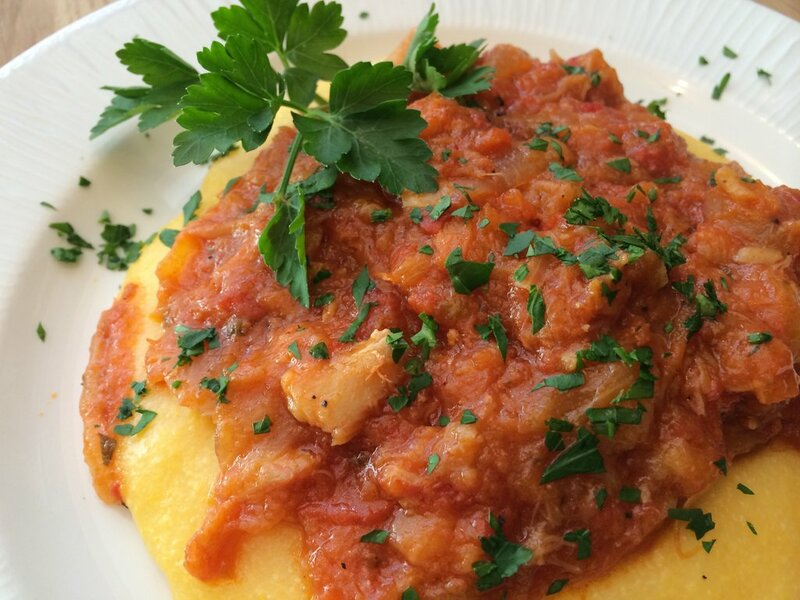 The mains combine a big dollop of wet polenta with a sauce and a choice of protein. 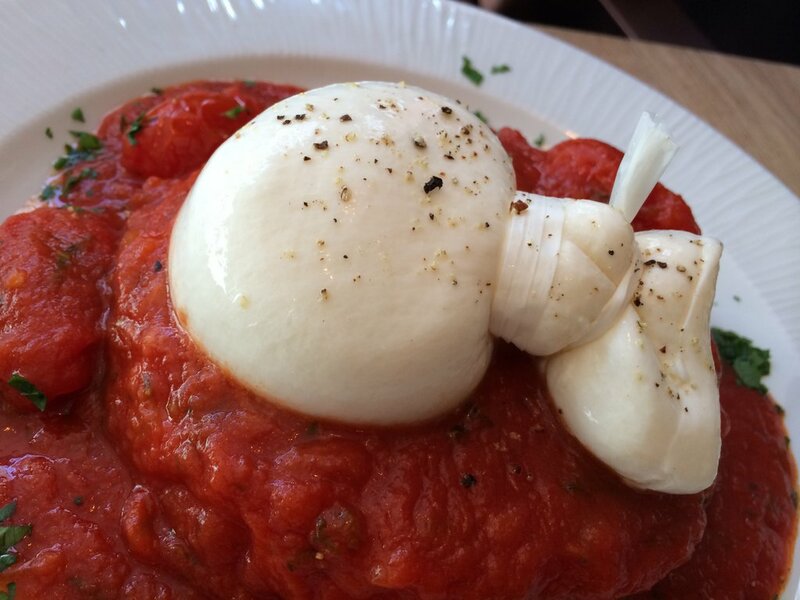 Burrata and cherry tomato sauce( £9.65) was a great dish. The burrata (a turbocharged mozzarella) is brought in every other day from Puglia so it is extra fresh and its delicate flavour was not overwhelmed by the polenta or the sweetness of the cherry tomatoes. Baccala’ alla Vicentina (£11.35) was a straightforward plate of salt cod in a light tomato sauce. The waitress seemed nervous about me ordering it as it might have a few bones in. I assured her that I was old enough to navigate my way around a piscine skeleton and although she was right it was worth the effort. It was a dish that tasted like the best of home cooking. 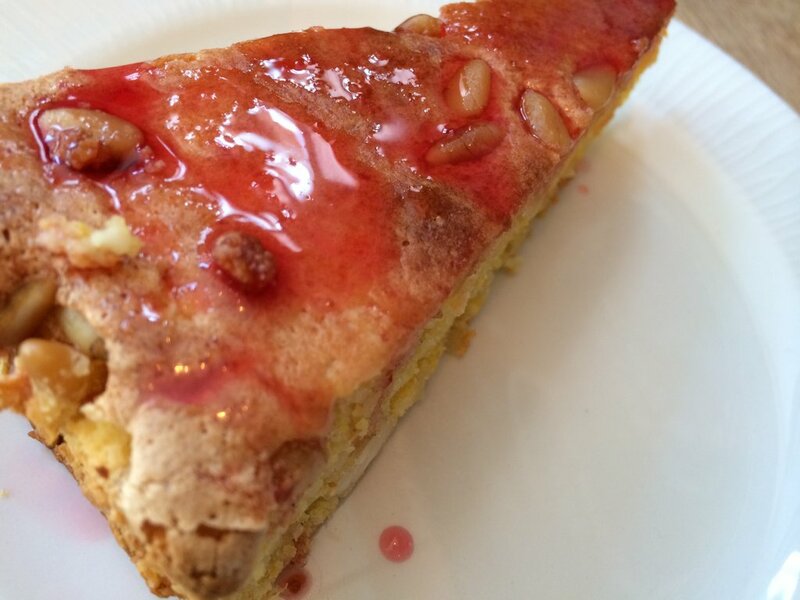 The desserts include some really indulgent Ferrero Rocher style cupcakes (gluten free) but the chanteuse chose the Bloody orange and almond polenta cake (£4.95) which she said was delicious. 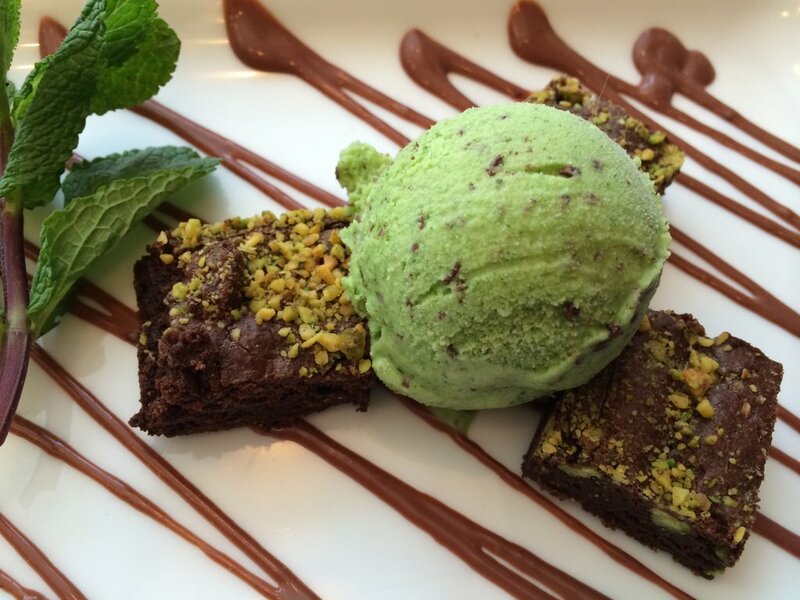 I went for a Pistachio brownie with Gelupo’s mint ice cream (£4.95). This was a mint choc indulgence that I really enjoyed. We washed down our desserts with a glass each of Moscato D’Asti (£6),a lightly sweet sparkler with that unmistakeable moscatel taste. 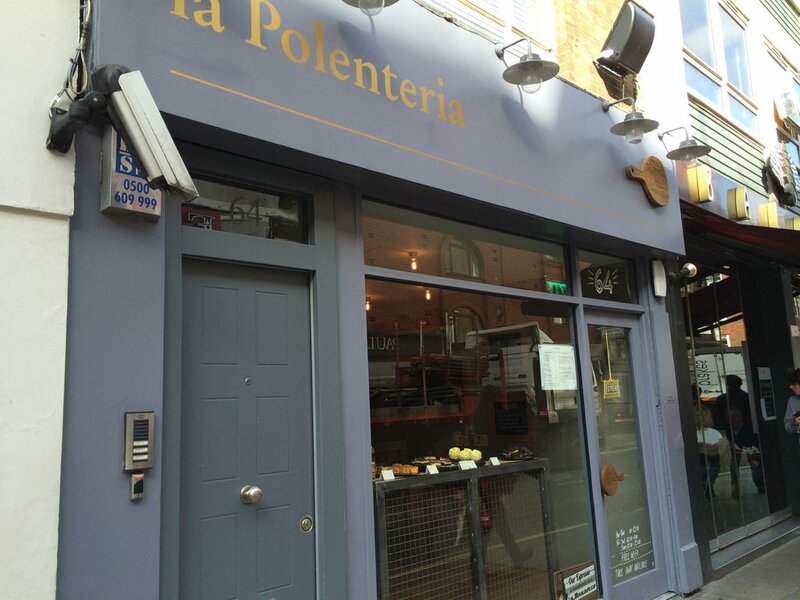 I really like La Polenteria. Polenta is a really healthy comfort food-and there aren’t too many of those around-and the dishes have an honesty and simplicity which is refreshing all at a very reasonable price point. I would love to see them rejig the menu a little however. Soho is the kingdom of small plates and maybe offering the menu in small plate/large plate options would give greater flexibility especially if punters wanted several courses or in the summer when lighter options might be more suitable.